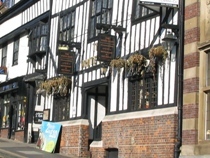 The White Hart Hotel in St Albans is a very old building (built 15th century) halfway down Holywell Hill. It is a pleasant two room pub that is friendly and cosy. Two real ales were available at the time of the visit (around 9pm on a Wed) but an hour later the labels on these handpumps had been turned around so no real ale was available. This was disappointing as the advertising board outside mentions up to four real ales are available. The first room as you enter is small and appears to be the locals/regulars area but if you walk through this and turn left there is a nice comfortable room that backs onto the other side of the central bar. Background music was pleasant and consisted of a variety of old songs. There is a large central room that looks as though it is used as a dining room for the hotel but this room is normally empty. If the White Hart Hotel could be tastefully refurbished and the middle room made use of this place could have potential. The lease is currently for sale (May 2007) if anyone wants to give it a go. All in all a pleasant, cosy place to drink if you're after a quiet chat but real ale availability could be improved.